Designed to keep flexibility in mind, Kolpak has several walk-in upgrades and options that offer many advantages to foodservice professionals. Hardware packages that Kolpak offers include chrome handles, door locks, hydraulic door closers, and adjustable hinges for simple adjustment on the fly. One of the many upgrades and options that is available from Kolpak is their Air Shield. This is simply placed at the doorway of the walk-in, and activates automatically when the door is opened. 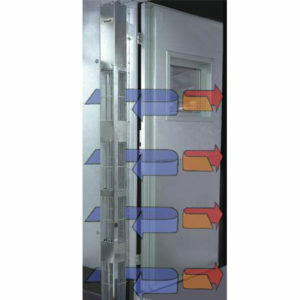 This keeps cold air inside the walk-in, and minimizes heat from the kitchen from entering. To finish your walk-in upgrades, you have the choice to include 26 gauge Galvalume, pre-painted, embossed aluminum, stainless, and white. Kolpak keeps up with the demands of foodservice professionals by continually providing walk-ins that have the flexibility to fit any need!